Oxford University Press, USA, 9780195128864, 272pp. Long hours, low wages, and unsafe workplaces characterized sweatshops a hundred years ago. These same conditions plague American trucking today. Sweatshops on Wheels: Winners and Losers in Trucking Deregulation exposes the dark side of government deregulation in America's interstate trucking industry. In the years since deregulation in 1980, median earnings have dropped 30% and most long-haul truckers earn less than half of pre-regulation wages. Work weeks average more than sixty hours. Today, America's long-haul truckers are working harder and earning less than at any time during the last four decades. 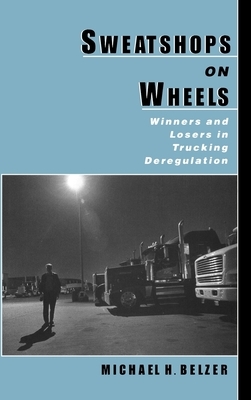 Written by a former long-haul trucker who now teaches industrial relations at Wayne State University, Sweatshops on Wheels raises crucial questions about the legacy of trucking deregulation in America and casts provocative new light on the issue of government deregulation in general. Michael H. Belzer, a nationally-known expert on the trucking industry, is Associate Professor of Industrial Relations and Director of the Graduate Program in Industrial Relations at at Wayne State University and an assistant research scientist at the University of Michigan Institute of Labor and Industrial Relations. He is currently conducting two major government-funded research programs on truck safety. Prior to earning his Ph.D. at Cornell's School of Industrial and Labor Relations, he spent eight years as a Teamster driving a tank truck over-the-road.